Lifestylist Suzanne Felber shares her Lifestylist Look fashion styles and trends. Her shop is in Dallas, Texas at Lula B's Oak Cliff. Never in my wildest dreams did I every think complete strangers would be complimenting me on my shoes, but now that I'm an Amazon Influencer it's happening! I have hard to fit feet, and it seems like I'm not the only one that struggles with finding shoes that have some style but are still comfortable, and I want to share my favorites that I have purchased so far, with more to come! Being a Lifestylist® means that I do a lot of walking - through airports, around job sites, and in our shops helping people. I've become a Lazy Lifestylist and my foamy, not pretty clogs have been what you have usually seen me in for years. Considering I buy everything else on Amazon, I thought why not shop for shoes and boots there as well? There were so many styles that I have never seen in a store that I shop at, and their return policy gave me the confidence to go for it. My first pair were these Socofy wedges. They had good reviews, had lots of style and I thought were well priced. And of course thanks to Amazon Prime had a two day free ship. When I got them I was a little aftraid - the wedge was higher than I expected and I tend to be a flats person. After I put them on though and take them for a stroll all of my concerns were gone. They were so comfortable, and the compliments started coming immediately, even from my coolest friends and clients! I loved these so much I'm going to buy another pair in another color, and a pair of boots as well. After my successful first purchase I decided to dive in again and buy two sets of shoes that would travel well with me and go with everything. One of the things I've learned is that you have to be sure that the shoes you like in the size you need are eligible for Amazon Prime. On a few pairs when I found the size and style I liked it was going to take up to a month to get them, and shipping was pretty steep. After I few tries, I found my new every day shoe - these LabatoStyle Driving Moccasins are the most comfortable shoes I have ever worn, are great looking, and the price is outstanding! I have given these a workout racing through airports, wearing on muddy job sites, and when I have to be on my feet for 8 hours or more at the shop, and I never thought I'd say this, but I like them better than my foamy ugly standard. I bought a size up, and the leather is so buttery soft they are a little bit loose, but I'm going to buy two more pair (at least!) one smaller and one the same. At under $20.00 I can afford to have multiples. Want to see more of our favorite Amazon finds? Visit our Amazon Influencer page and check out our Lifestylist List finds. We are adding to this daily so come back often, and please let us know what you think of these fab finds. It's official: I'm an addict. After we opened up a home retail store at Lula B's I thought it might be fun to try a vintage fashion store as well, focusing on what I call the Lifestylist Look. I had no idea how successful it would be, but I'm thrilled! It has been so much fun to be able to recycle clothes to people who are as excited about them as we are. We are on a buying trip this week in Florida and we are so excited to get these looks back to the store. At this time we are only selling at the shop, but we are hoping to do an online shop as well soon. We love a look that's unique and can make you stand out in a crowd... in a good way. A recent day trip to Round Top, Texas where we discovered lots of shops that brought out the urban cowgirl in us. 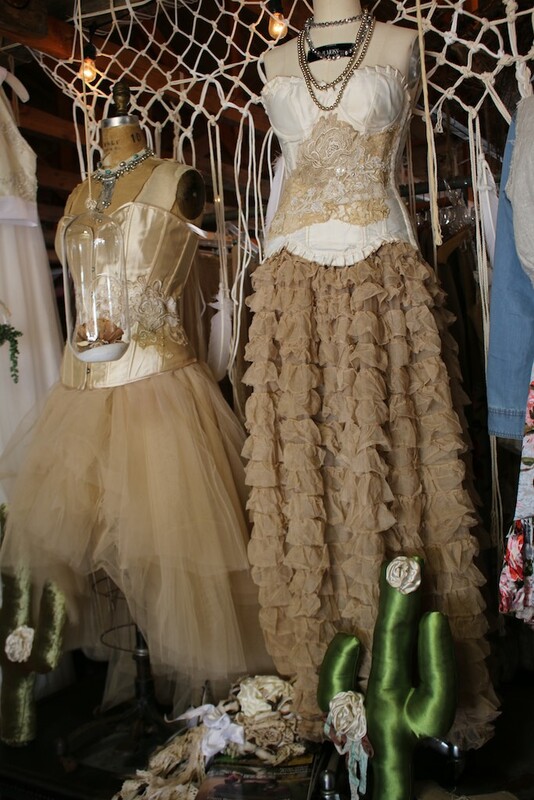 Vintage cowboy boots, clothes, and these beautiful corsets and skirts had us thinking about where we could wear them first. It's a gloomy day in Dallas today, so I decided to update my Lifestylist page on Pinterest. It's a lot of fun to go through thousands of images and choose the ones that are of things I'd wear. Visit our Lifestylist Look board and see what we found.